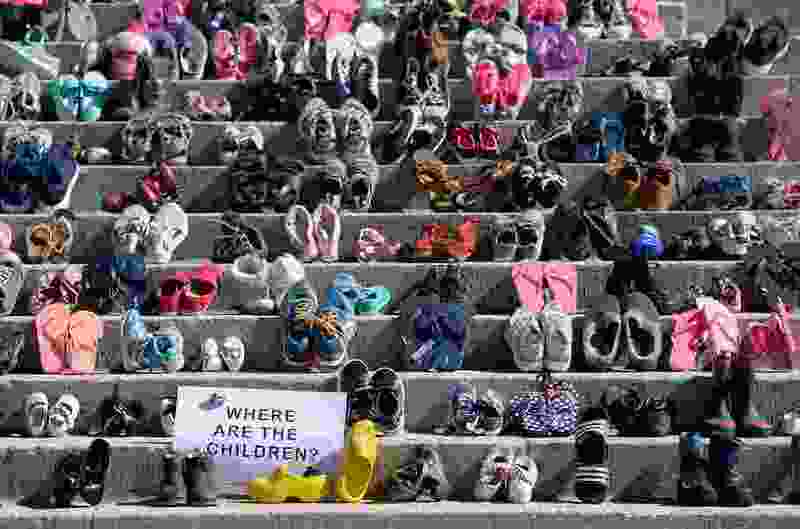 (Francisco Kjolseth | The Salt Lake Tribune) Kid's shoes are laid out on the capitol steps to represent the children separated from families as a large crowd gathers at the Utah Capitol on Saturday, June 30, 2018, to protest the Trump administration's immigration policies that have led to the separation of migrant families. More than 750 locations around the country planned to participate in the 'Families Belong Together' event, including at the nations capitol. In Thailand, 12 children and their soccer coach made a wrong turn, got themselves trapped in a cave and quickly became the target of an all-hands-on-deck rescue effort mounted by national and provincial officials and eager volunteers from all over the world. In the United States, 2,000 children — maybe 3,000 — and their parents found out that the rules for seeking asylum in what was the world’s largest and proudest sanctuary got themselves trapped in the administration’s “zero-tolerance” immigration policy and quickly became lost in a bureaucratic purgatory that, for some of them, may never end. In Thailand, one of the divers taking part in the rescue attempt died when he ran out of oxygen during a dive aimed at bringing aid to the lost children. It can be hard for normal people to grasp that their own government — and its individual agents, officers and attorneys — is involved in a heartless and brainless effort to visit so much deliberate cruelty upon asylum-seeking families. We are separating the children from the parents, depositing them in different places, apparently in sometimes squalid, frightening and sealed-off facilities, expecting children as young as 1 year old to explain themselves and their situation in court and not allowing members of Congress or other independent overseers to check up on what is happening. If you want to make people believe a lie, the experts taught us, make it big. And, apparently, if you want to make people sit still for an atrocity, make it just big enough to have no personality, no individual human face. And, of course, prepare the ground by spending years telling lies about how many people are crossing the border illegally, how many of them are gang members and drug dealers and rapists, basically dehumanizing them in the eyes of many Americans so we don’t become concerned with those victimized in our name and with our money. The government has been so closed-mouthed and so slow to move that it is difficult at this point to know what it true. But there is a flood of reports that parents are being sent back to their home nations without their children. That they were promised they would be reunited with their children if they agreed to that return but, in many cases, haven’t been. There are stories of children in detention facilities being ordered not to hug their siblings. Of 60 or more young girls being held in a windowless room with no bedding, no food for days and the air conditioning cranked up. Of parents being told that they were being sent back to their native countries but that their children were staying in the U.S. and being put up for adoption. All this at a time when the president of the United States stirs up public mistrust, if not downright hatred, of the news organizations that are struggling daily to find out the truth about these children and what is happening to them. This is the kind of behavior that, when carried out by non-superpowers, gets people hauled before the International Criminal Court or some special war crimes tribunal. Here, all we can do is keep the story alive and hope that Congress — this one or the next — finds its voice and demands both answers and reparations to those damaged by this hateful public policy.